In the car on Saturday morning, I turned on my local NPR station. Animal House was on. 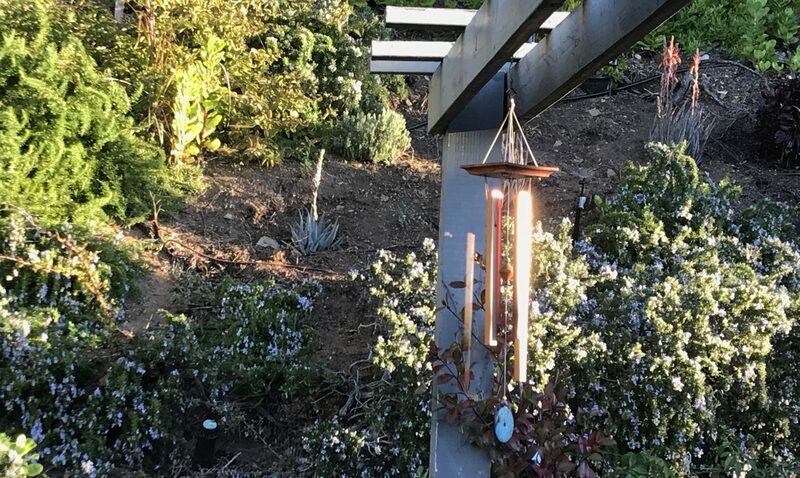 I can listen to almost anything on NPR, but calm animal behavior advice at 5 am kind of lulls me back to sleep, so usually turn it off. This segment, titled “Is There a ‘Chill Pill’ For My Cat?” got my attention. The soft spoken Dr. Katy Nelson talked to a beleaguered 90-year old Florida woman about her misbehaving kitty. She spoke of bottle-fed cats (wait, my cat was bottle fed) and how they don’t learn their manners from a momma cat (oh no!) and how that could lead to bad behavior. She suggested a cat behaviorist, or cat whisperer. I can’t believe I am actually thinking about this as possibility; I am identifying with a 90-year old cat lady. Our cat does what he wants. Most of the time he sleeps. Occasionally he looks at us. Sometimes he walks in front of us. He puts up with our need to hold and pet him. At times he even seeks out our attentions. We have a live and let live relationship. Until recently. Now due to a change in his access to the outside, his in and out privileges have been limited. Come to find out he is easy going when he gets his way, obnoxious when his desires are less than fulfilled. Now he demands in or out, and he gets it, because you can not ignore his crazy making and unrelenting meows. After listening to Dr. Nelson, I feel like an inadequate cat parent. This behavior has been created by a change in our behavior, not the cat’s. We have two doors off the back of the house. Both have screens that have been custom sliced (by the cat), just enough to allow him entrance in to and out of the house. My husband dubbed them cat doors, the perfect accommodation for cat and human biorhythms. One evening I sat at the dining room table reading and I hear, crunch, crunch. Not an unusual sound, but a little louder. I look up and a raccoon is chomping down cat food, right next to me. Unbelievable. I chase the critter out; then he stood on the other side of the glass sliding door eyeing me and the food. Disgusted, I secure the door and wash the cat dish. The cat doors are now sealed, the cat’s desire to venture at will hasn’t changed, and our sleep cycle is interrupted. Why do we put up with this and still greet our cat with love. Why do shows like Animal House exist. Crazy or typical? We reach out to people as well as animals out of a longing we hold deep within to not be alone, to share what we feel, to relate in some way to the world around us. We yearn to be accepted for who we are, warts and all. We spend much of our lives in an unfolding saga, sorting among all the others we meet to find those who we believe best understand us, with whom we can feel free to just be ourselves. Yet with animals, I find, we do so quite differently. By their sides we let down our guard and show them more of who we are. Within the shelter of our own homes, one-­half to two-­thirds of us look on our pets as full-fledged family members. We speak of our pets as if they’re our children, invite them into our beds with us . . . While we all talk to animals in one way or other, an astounding 94 percent of us speak to them as if they were human. And more than 90 percent affirm that our pets indeed respond in turn to our human fancies, emotions, and moods. By the same token, just as many believe our pets share human personality traits, such as being inquisitive, outgoing, or shy. Considering how we regard our connection with them, perhaps it’s not surprising at all that slightly more than half of us would willingly risk our lives for our pets, and even more believe that our pets would devotedly rescue us. Apparently this thing we do with animals is a part of being human. 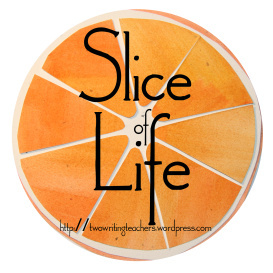 Thank you Tara, Dana, Anna, Betsy, Stacey and Beth for Two Writing Teachers blog and Slice of Life Tuesdays. Read more slices and post your own here. Celebrate This Week: Why Write? Love that picture of your kitty — love the expression. I get it .. I have two cats and they are definitely family members. It’s sort of crazy how much we talk to them and include them in our daily lives. And a racoon .. how did you stay so calm as to simply chase the critter out?! I’m just getting a new back door that will have a real kitty door for Mickey…hopefully the urban wildlife will not come in. I notice this connection you write about so well. My cat has now taken to meditating with me, when I sit for 15 minutes in the morning I have a warm blob on my lap. In my other house, we had raccoons trying to get in, but since there was no ‘cat door’, they did not. But we did have to shoo them away occasionally. I’m glad you’re okay; they can be dangerous. I don’t have a pet anymore, and both miss one and don’t. Interesting about the research in the way pets are treated, probably just in first world countries, right? Cats do want to have their way I know. My ‘former cat’ used to knock things off the dressers in order to wake us up so he could go out. Good luck for new habits, Juieanne. Love your precious cat’s face. I’m not a cat person (i.e., mostly because I have allergies), but their personalities intrigue me. I found the way you referred to yourself as an inadequate cat parent as fascinating. I’ve heard many a cat parent say that. I had to laugh out loud when I read about the raccoon! I lose all reason when it comes to pets – it’s a real weakness. I cannot imagine a house without at least one of these wandering around. 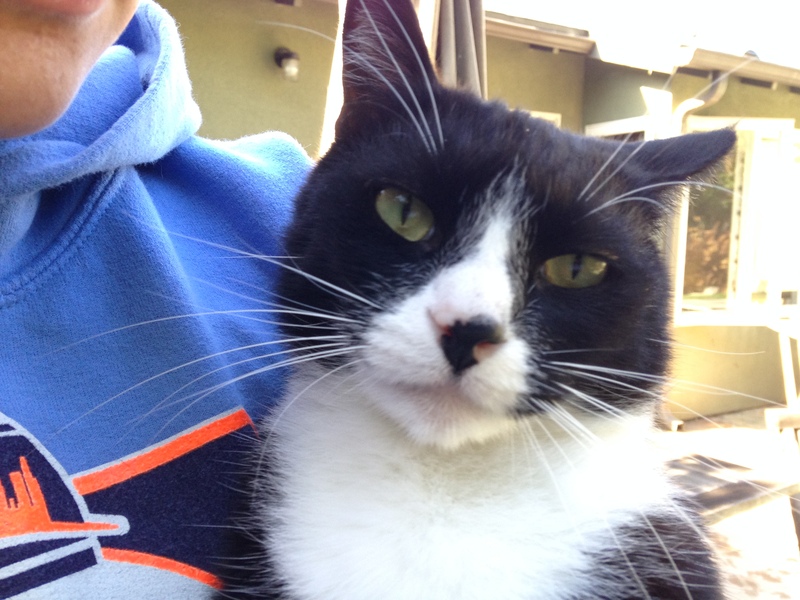 You cat just has the LOOK of personality, Julieanne. That expression on the cat says it all, I will tolerate you. Yes, pets are an extension of our family. I am so sad not to have one, but it would not be fair to it since we are gone a lot. You are grace under fire, a raccoon in the house? I might have freaked out a bit more. Oh, those animals of ours! Crazy trying to live with them…can’t imagine living without them! What a shock to find a raccoon by your side! !